Need a great life jacket or vest for your dog? We have some tips and recommendations for you. With summer just around the corner, it's time to think about water safety. If you've ever wondered if a life jacket is really necessary for your dog, the answer is YES! Sadly, each year, thousands of dogs die in swimming pools. (source) These numbers don't even reflect the number of drownings in rivers, lakes and oceans. Life jackets for dogs are important, no matter how strong a swimmer you think your best buddy might be. Many people assume all dogs are good swimmers, and that's not necessarily true. While certain breeds are better at swimming than others, there are dogs like Bulldogs and other brachycephalic canines, such as Pugs and Boston Terriers, that don't fare as well in water. Due to their heavy heads and chests, they tire easily and can sink like a stone. 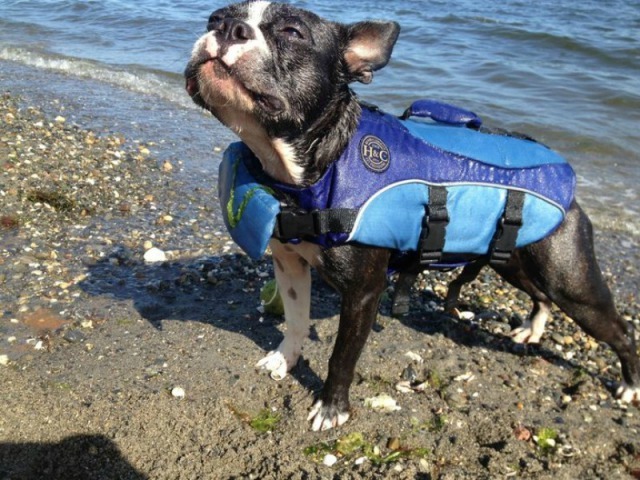 For these breeds and others that are not natural swimmers, it's especially important to outfit them with life jackets and make sure they fit properly. Even if your dog is a great swimmer, all dogs should wear personal flotation devices for the same reason humans do when out in open water. Dogs aren't fish and can't swim forever. Choking on water and/or general fatigue are real dangers for a dog in water, so give your dog the added security of wearing something that keeps him from drowning. 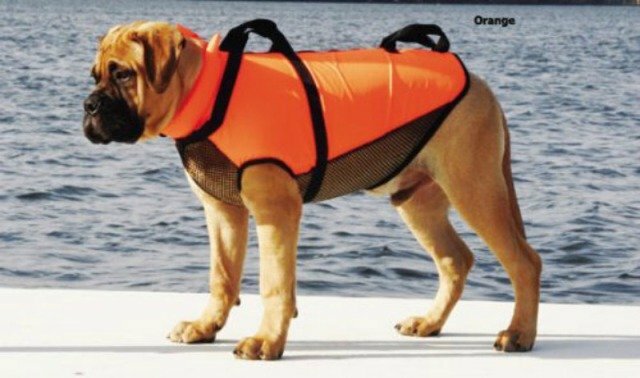 A canine life vest also makes your dog more visible in open water. Most life vests are reflective and you should get the most reflective vest you can. There are many brands of water jackets for dogs, so how do you choose a good one one for your pet? Well, the good news is that any of the vests mentioned on our list will likely work well for your dog. There are small differences, so the key will be in finding one that fits your dog's body and his particular needs the best. Getting a vest that fits properly on your dog is important. It would be great if you could take your dog to the nearest pet store and compare how each one fits your pup, but unfortunately, many stores have very limited selections and inventory, so it may be easier to order one from Amazon.com, which has a large variety and inventory of dog life jackets. You can select the one you think will work best, and if it turns out to be too short for his long body or too long for his short body, you can exchange it for another one. Just look carefully at the design of the jacket; you should be able to tell by looking at its cut if it will fit properly, in the right size, of course. For example: If a life jacket has a high collar, but your dog has a short neck, that jacket won't work! And if the jacket has a short back and your dog has a long back, you should find another vest. Sizes "small," "medium," and "large" tend to vary with brand, so it's best to shop based on exact measurements. Be mindful that some vests are designed for big chested dogs and narrow hipped dogs while others are for more square dogs. When the vest arrives, try it on your dog and see if your dog looks comfortable. Adjust it to fit properly. If he is not walking properly or he seems to be top heavy, the vest probably does not fit correctly. Also make sure to look and see if any part of the vest is blocking his legs or rubbing on any part of his body in an uncomfortable way. It is also important to see where the handles are on a life jacket. Make sure to put your hands on the handles and see if they are placed properly for lifting your dog from the water. 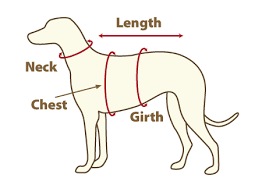 Ideally, there should be one closer towards the shoulders and one towards the legs rather than a handle right in the middle of the dog's back so the dog's head does not tip forward. Most importantly, the life jacket should protect the dog's head raising it sufficiently to keep water away from his nose and mouth. But the wrong dog life jacket can also have the effect of allowing the animal's lower body to dip or sink too much, instead of maintaining a roughly horizontal posture. When dogs are supported more evenly in front and back, it leaves them in a safer, more natural doggie paddle position, making it easiest for them to swim. When your dog is in the water, he should be able to float comfortably and remain stable with as little movement as possible. Is the jacket relatively easy to put on and take off? That would be helpful! The last thing you need with a cold, wriggling, wet dog is fasteners that make quick removal impossible. By all accounts, Kyjen's Outward Hound Life Jacket is the No. 1 selling life preserver for dogs on the market today. This extremely popular brand is considered sturdy, durable and reliable for keeping your pooch afloat. It features a convenient top-grab and side handles for easy rescue, bright colors, and reflectors for improved visibility, fully adjustable chest and neck flaps with front float assists for keeping your dog's head above water, quick release buckles, and a durable neoprene belly-band to keep the jacket firmly in place. The handle design is a one-piece sewn strap that wraps around the belly and the back of the dog for added support. According to some customers, the handle is positioned a bit more more towards the front of the jacket causing some dogs to tip forward a little when lifted, so you need to watch out for that. Some owners complain about the durability and quality of the vest, but for the extremely affordable price, it is an overall great value life jacket. Another popular PFD (pet flotation device) among consumers is Ruffwear's K-9 Float Coat. It is one of those near perfect products that consistently gets rave reviews from owners of the product for excellence in product design and value. This life jacket for dogs is constructed from abrasion-resistant materials and comes in red, blue, and yellow with reflective trim. It features easy-to-clip sheltered buckles and a wide, low-profile, handle to help dogs out of the water. There's also a light loop for attaching a Ruffwear product called The Beacon, a bright LED dog light designed to keep dogs visible in low-lighting conditions. Two of the most notable features of this vest are the wide, telescoping neck closure for keeping your pet's head well above water and adjusting to a range of neck positions. The other is the strategically placed closed-cell foam panels for improved buoyancy that allow for a natural swimming posture. It's more expensive than the Kyjen, but the overall quality and durability of the Ruffwear seems to make it a really great overall value. 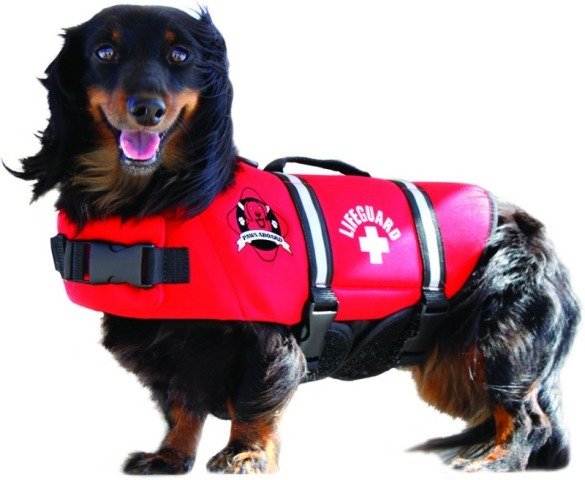 EzyDog's Doggy Flotation Vest advertises superior flotation for your pet. Also a very popular brand with pet owners, it has consistently received 4 or 5 stars and glowing reviews. The heavy-duty polyester construction is said to add up to 50 percent more flotation than many other canine life vests, and it features a grab handle for lifting, a zippered pocket, and adjustable neoprene straps to form an ergonomic and secure fit. Color options include red and yellow with reflective detailing. This life vest comes in many sizes, ranging from extra small to extra large. For small dogs, this is one of the best bets. Pet owners looking for a dog life jacket that's both fun and reliable might want to check out Paws Aboard's neoprene designer doggy life jacket Red Lifeguard. This PFD offers all the flotation and safety features as the other brands, but with an adorable lifeguard design. Available with reflective strips for maximum visibility, the Red Lifeguard also offers a handle for lifting pets and adjustable nylon straps with quick-release buckles for easy off and on. This Paws Aboard model includes a wider neck/chest closure, to help with front flotation, and a heavy-duty Velcro fastening system for keeping it secured. A nice feature is the breathable mesh underbelly to help keep dogs more comfortable. Henry and Clemmies Dog Life Jacket is another doggie float vest to consider when looking for extra buoyancy for your dog's head and chest. Besides a broad neck/chest strap, it has a flap designed to come up just below your pet's chin to help keep your pet's head up and water out of his mouth. This particular dog life vest comes in blue and is made from water-resistant, 600d Ripstop polyester fabric. Ripstop fabrics are woven fabrics, often made of nylon, using a special reinforcing technique that makes them resistant to tearing and ripping. Reinforced stitching with buckles and straps ensure a secure and comfortable fit, and a sturdy reinforced grip handle for easy reach and rescue make this a solid choice for pet life jackets. You can find this dog life jacket on Amazon. 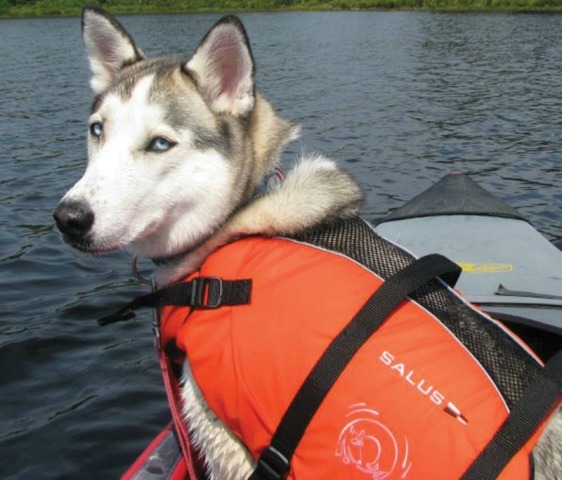 Water safety specialists Salus began making life vests for people but soon branched out to include life jackets for dogs. It's a Canadian company that does all the manufacturing itself, so there's no outsourcing. Salus has won several awards for water safety and innovation. What distinguishes the Skippy Life Dog Jacket from the rest of the pack is what Salus calls the foam zone - where foam covers the belly, chest and sides where the flotation material is needed most. Due to the added foam on the belly, dogs float higher. Three clip attachments with buckles on the opposite side offer a centered fit. These dog life jackets come with one open-topped mesh pocket and two handles for heaving waterlogged heavies. When lifted, their weight is distributed across the padding, not the straps. They come in red or blue and are available through Salus and a variety of water sports sites. The Fido Float is a dog life vest with a sturdy zipper that runs from tail to collar for easy on and off. At the lower end of the price range, the Fido Float features generous closed-cell buoyancy support, a broad U-shaped buoyancy collar to keep your dog's head above water, an ergonomic fit that prevents twisting, stepping or swimming out of the vest and two specially placed assistance handles for lifting. The Fido Float comes in bright colors for added visibility. 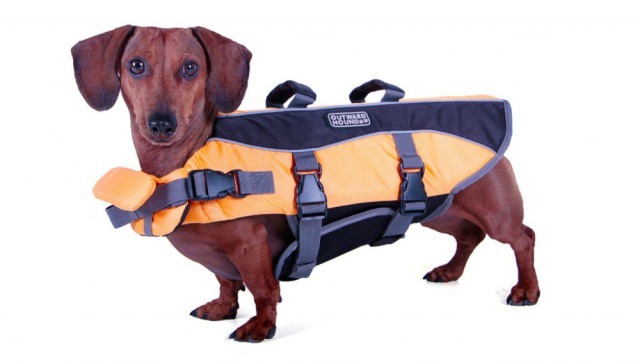 It should be noted that this particular life preserver is not recommended for breeds with very short legs, such as Dachshunds. 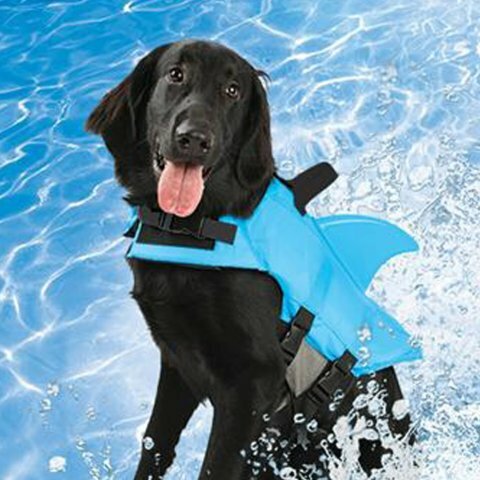 With its cute little 'dog fin' sticking up, you might think the Swimways Sea Squirt Life Vest is not a serious contender for your dog's water well-being. But, to the contrary, your dog can look cute and stay safe according to most customers, who rate the Swimways pretty high. One consistent warning from customers is that the jacket runs large. Check it out here. Now that you found a great float vest for your dog, go and have fun like this guy, won't you? Pet Tip: When putting your dog vest on your pup for the first few times, give your pet a treat to get him to associate the vest with something positive. Don't give him treats before he goes into the water! Originally created April 2015. Updated May 2017.